Good morning our valued customer, welcome to Bali. 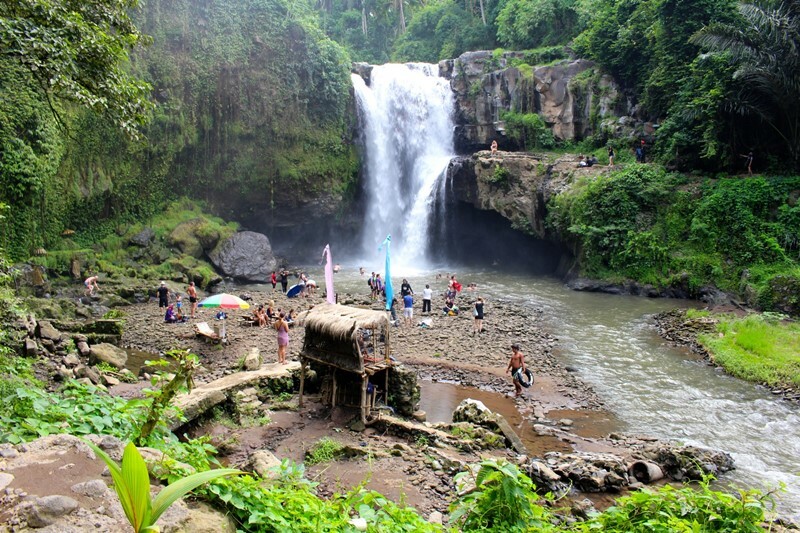 Waterfall attractions in Bali, usually dominated by North Bali, such as some of them, namely Gitgit Waterfall, Banyumala, Sekumpul, Munduk, Twin waterfall and other. But those of you who stay at Kuta area or other areas of Southern Bali, and don’t want to take drive too far or travel far from your hotel, then the presence of the Blangsinga or Tegenungan waterfall can be a cure for your longing for the atmosphere of green and thickets with clear rivers and easy find any drink around the waterfall. Bored with the atmosphere of the beach and crowded of touristic spot and want to enjoy different nuances of nature, then visit the Tegenungan waterfall could be one of the answer for you, Its located in the village of Kemenuh, Sukawati District, Gianyar Regency, Its need about 1 hour drive from Kuta area. Tegenungan Waterfall is also known as Kemenuh waterfall, as local people much easier to remember the name of the village, so taking the name of the village is common in Bali. If you stay at Sanur area, its much closer drive about 30 minutes, or if you stay at Saba Beach you are 15 minutes away from this waterfall. This waterfall was originally name is Srongsongan waterfall, then why it is now known as Tegenungan waterfall and some call it Blangsinga waterfall? This is because this tourist attraction can be accessed from two different village,if you travel from the West side of the Banjar Tegenungan, Kemenuh Village, Sukawati District, the residents in this village call it Tegenungan Waterfall. Whereas now there is a new access that is also made by the people of Saba village or from east side, towards Srongsongan waterfall, from the East side travel through the Blangsinga village or Saba Village, Blahbatuh District, so that the people here know it as Blangsinga waterfall. The waterfall that flows on the Petanu river is indeed located on the border between the Banjar Tegungan and Blangsinga. So the name of the Blangsinga waterfall is same as Tegenungan Waterfall. Indeed the branding of Tegenungan was first known to tourists, which was around 1998, the name appeared when college student of UNUD in 1998 -1999 they introduced this place as Tegenungan waterfall. The information above is certainly important so that tourists are not confused with these two different names. Let’s wait for this place to change to its original name, Srongsongan Waterfall or still use the name or current branding, Tegenungan or Blangsinga, the name is not a reason to come here because once you here can explore the beautiful waterfall which located among two village. This tourist attraction is quite popular as a destination for tours in Bali. Indeed, this spot offering a pretty spectacular view, the increasing number of visits to tourist attractions in Bali, encourage the management from both village continue to improve themselves, increasing various services and facilities. At the Tegenungan / Blangsinga waterfall location, a dressing room, toilet, restaurant and a place to relax are provided. New D’Tukad just built on side of the Waterfall, where visitor can relaxed, drink, eat, swing and swimming while listening the sound of the water. The location of Tegenungan Waterfall is strategically located on the Batubulan – Sukawati – Mas – Ubud tourist route, so the program for your tour in Bali does not take much time to access Tegenungan Waterfall, from the Sukawati market, which is the largest art market in Bali for souvenir shopping and local handicrafts, just about 4 km away. So if you are a nature lover and also shopper Paradise, please book our Bali Cab Driver services to visit Sukawati or Ubud markets, then you spend the rest of day by visiting Tegenungan waterfall, please don’t forget to bring towel, swim wear or short , sun lotion, mosquito spray and some cash for pay entrance ticket and some for buy drinks. The attraction of Tegenungan waterfall is not so high, only 15 meters in range, but the water discharge is quite large, the roar of the Petanu river has been heard from a distance. The water is clear and sometime bit yellowish, depend on the season and activities of the local at the upstream, so if you get closer, you can feel the fresh Tegenungan waterfall, flying water vapor that hits the visitors’ faces plus the beauty of rock cliffs, on the river flow, adding to its naturalness, can be the best photo object on your tour. In the past , there were a Bungy jumping attraction was once established in Tegenungan waterfall area, but it ran aground and did not run smoothly, there was still a stone wall from the attraction, but now it is back to natural, so tourists visiting this place can enjoy their natural beauty, whether they want to take a bath , photos, or trekking along the clear river flow with green valleys full of tropical trees. Be careful if you take a shower, because the flow or discharge of a large enough water can be dangerous, if you have lifejacket is much more safe to go around the waterfall. Your visit here will parking at the parking lot, then you need walk through hundreds of stairs and surely its take much time, if you have no time to walk down, please stop at the top and find nice spot for photo and you see the beauty of Tegenungan waterfall from a distance, you can relax here, take pictures with the background of the waterfall before continuing the journey. 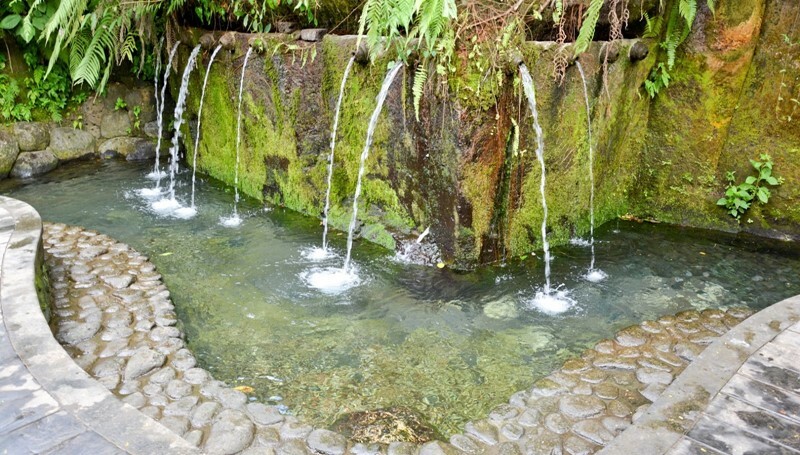 Once you walk down and pass the hundreds of stairs and closer to the river bank, you see the fresh bathing fountain with clear water near the temple . From this bath, you have to continue the journey along a flat road of about 75 meters to get to the bottom of the waterfall, food and beverage stalls are available on site, your curiosity and fatigue will be paid off after watching the beauty of Tegenungan waterfall up close. Please contact us if need a Bali Cab with driver to explorer this natural beauty.